Liam Cunningham is an Irish actor. He has appeared in numerous film and television productions including A Little Princess, First Knight, Jude, The Guard and the BBC One science-fiction drama series Outcasts. 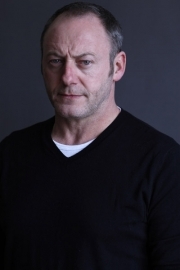 He will appear as Davos Seaworth in the second season of HBO's Game of Thrones. Cunningham was born in East Wall, which is an inner city area of the Northside of Dublin. He has three sisters and a brother, and was raised in a Roman Catholic household. Cunningham dropped out of secondary school at 15 and pursued a career as an electrician. In the 1980s, Cunningham moved to Zimbabwe for three years where he maintained electrical equipment at a safari park and trained Zimbabwean electricians. After returning to Ireland, Cunningham became dissatisfied with his work as an electrician and decided to pursue his interest in acting. He attended acting classes and began to work in local theater. Cunningham's debut film role came in Into the West. His on-screen acting continued with minor roles in War of the Buttons, A Little Princess, Cracker-Best Boys and First Knight. Cunningham's breakout role came in Jude, playing Phillotson. He continued with small character roles in Police 2020, Falling for a Dancer, Shooting the Past, When the Sky Falls and Revelation. Cunningham came to international prominence with his role as Captain Ryan in the critically acclaimed independent horror film, Dog Soldiers. Since then, Cunningham has starred in numerous high budget British and American films including The League of Gentlemen's Apocalypse, The Wind That Shakes the Barley, The Mummy: Tomb of the Dragon Emperor, Hunger, Clash of the Titans and Centurion. On television he appears as the President in the BBC programme Outcasts first broadcast in February 2011, and will appear in the second season of Game of Thrones. Cunningham currently resides in Dublin with his wife Colette and daughter Ellen and sons Liam Jr. and Sean. Whole or part of the information contained in this card come from the Wikipedia article "Liam Cunningham (Schauspieler)", licensed under CC-BY-SA full list of contributors here.